On Saturday 10th March 18 I woke up at 6.45 am having a few niggly pains. I asked hubby to take the girls downstairs so I could have time alone to see what came of them. I was 40+8 and hour later I knew this was definitely labour. Hubby took kids to grandmas and I phoned my independent midwife (who is over an hour away) . I know my body pretty well now and always go into urinary retention in labour which slows me down and distress me. I got in bath to relax then when got out put in my tens machine . Debs my midwife got here around 10.30 . She helped me get some urine out and checked I was 6cm. Pool was ready now and I got in . It was heaven. I love being in water. The rest of the amazing Yorkshire Storks midwives turned up . Then at 12.03 twin A Tobias was born at home weighing a healthy 8lbs 3oz It was a surreal and fantastic experience. 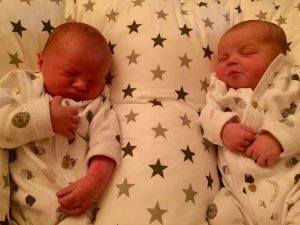 We had some skin to skin in the pool , our first breastfeed and waited for cord to stop pulsing, I was still getting contractions for twin 2 and felt quite conflicted on what to concentrate on. So cord was cut and he went to daddy for skin to skin. I remained upright and active but twin 2 had some room now and decided to do a full flip in there now his brother had gone. At one point he went transverse and dropped his heart rate. It recovered when he went back head down but unfortunately settled OP ( back to back) . I laboured for another 4 hours with a back to back baby which was more painful but less effective in bringing baby down. I was all over the house, up and down the stairs , sat and fed Tobie in living room and then back in the pool. After a VE midwife found there was something in the way and not quite sure what it was, could be cervical lip or possibly cord we didn’t know. Babies heart rate was creeping up slowly and it was felt that his waters needed breaking to bring him down. I was obviously reluctant to go to hospital because of previous birth trauma and cascades of intervention but understood it was possibly risky to break water at home in case of cord prolapse or if baby was really comprised. I realised I was past the point of any horrible induction hormone drip so just had to get over my fear of a dry birth as I knew they wouldn’t let me in water. We went in and the medics where shocked that I’d carried twins to 40+8 and I’d birthed Tobie almost 5 hours earlier. I was so pleased to have my midwives stay with me and explain to the medics that they often have twins born further apart when left Naturally and we don’t know much about spontaneous and physiological twin birth to conclude what is normal because twin birth is so interfered with. Twin 2 heart rate had now stabilised at 150. Consultant offered me an unnecessary c section which I declined . I was not too tired to birth my baby, I just needed waters breaking then calm and quiet to be able to get on with it. The consultant however wanted me to have an epidural and a trial of pushing in a theatre with a view to proceeding to a section if that failed. I remembered back from my first birth when I was failure to progress. When I agreed to section and signed the consent forms everyone backed off and I birthed my baby. I knew I had to do the same again because I know my body and know nothing will happen for me with medical intervention and a bright busy environment. So I signed everything, my waters were broken and all the medics left the room . I got up over the back of the bed facing away from everyone with my gas and air and tried to take back some control. The lights were low and I went right into myself and zoned out . I was talking to my baby asking him to come down soon as it would be better for everyone that way. The next time I opened my eyes claire my other midwife was in front of me. I felt instantly reassured like I could definitely do this before they came for us. A few minutes later I let my body take over and I felt his head come right down. A sheet was fully over my bum and none of the hospital midwives even realised my baby was coming, but claire and I knew. She lifted the sheet back and there was babies head much to the surprise of everyone in the room. The drs I think had come back at this point including the consultant. I remember hearing someone say “oh we’re too late”but I was thinking no this is just in time. My babies body followed soon after and I received him up through my legs. He had come out with both hands up at the sides of his face . So at 17.12. 5 hours after his big brother our second son Maximus was born weighing a lovely little 7lbs 8oz my smallest baby yet but great size for a twin. He was healthy and perfect and in no way affected by being born hours after his big brother . We had skin to skin and delayed cord clamping and as max is my last ever baby I wanted the experience of cutting his cord. So although I didn’t get to birth both boys at home I’m still really pleased I achieved a term plus, spontaneous twin vaginal birth with minimal intervention and no major drugs Just gas and air ( I do love gas and air and went through a fair bit lol ).